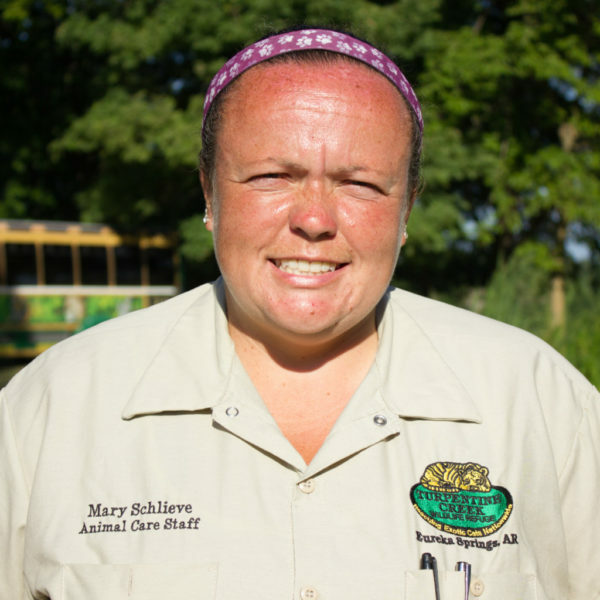 Mary Schlieve is a member of Animal Care Staff and is the Enrichment Coordinator of Turpentine Creek Wildlife Refuge. In these roles, she does everything from cleaning habitats, feeding and medicating the animals, organizing enrichment activities, and the list keeps going on from there! Born in East Troy, Wisconsin, Mary graduated from Northland College with a BS in Veterinary Life Science and with minors in biology and chemistry. It was in college that she first heard about Turpentine Creek. Outside of her biology class, she saw an intern flier posted and having always loved cats and feeling especially drawn to tigers she leapt at the opportunity and quickly applied. Two internships later, Mary found herself in love with all of the animals, the people, and the place that is Turpentine Creek Wildlife Refuge. It was a natural evolution then when she joined TCWR as a member of staff. Being from Wisconsin means that she is a loyal Green Bay Packer fan, lover of cheese, and prefers cooler temps. When this northerner is not working with the animals, she is also the Refuge’s amateur baker — baking birthday cakes, wedding cakes, desserts, and even our 25th Anniversary cake!